Got stinky shoes? 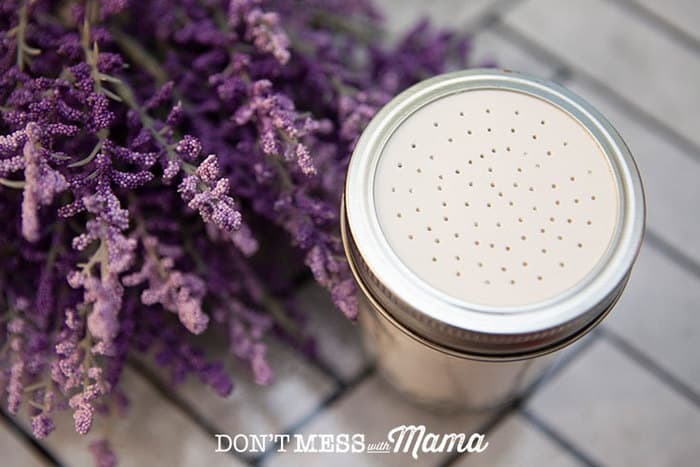 Deodorize them and make them smell fresh and clean with this DIY Shoe Powder. It’s so easy to make and made with all-natural ingredients. It’s like the natural remedy for stinky shoes. Got boys or men in your home? Got flats that you never wear socks with? Then you likely have stinky shoes… and you need this DIY Shoe Powder. Don’t worry… I’ve got boys, my husband, and lots of flats myself so I’m in the same boat with you. I used rely on store-bought shoe powders and sprays to deodorize my shoes, but then I started reading the labels. The active ingredients are really just cornstarch and baking soda. What?! So why are we paying $5-10 for them? Not only that but the fragrance used in those shoe powders and sprays don’t disclose exactly what’s in them. I’ve been on a mission to get artificial scents and fragrances out of my home to avoid toxic chemicals as much as possible. Companies don’t need to disclose the chemical constituents in those fragrances, which could have 200+ different ingredients in just one fragrance. If you’re family has asthma, allergies or other respiratory issues, I highly recommend avoiding artificial scents and fragrances. We have long since given them up and breathe so much easier now. 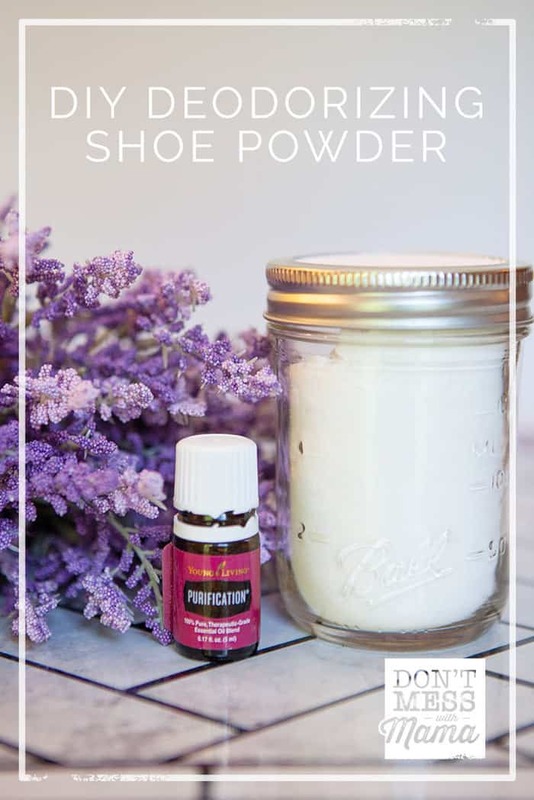 Plus, it’s so fun to make our own household cleaners like this DIY Shoe Powder with essential oils to customize the scent. Just remember that not all essential oils are the same. I don’t buy them on Amazon or the health food store. This is where I buy mine. 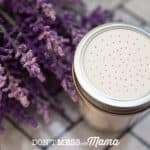 With this DIY Shoe Powder recipe you’ve got options… I prefer arrowroot powder (it’s works similar to cornstarch) and I just find that I have it on hand for cooking and other DIY projects. But if you prefer or only have cornstarch on hand, you can use that. You can use different essential oils for this recipe, but I really like the blend called Purification. It’s made with lemongrass, citronella, rosemary, tea tree and other essential oils. There’s no fillers and it’s the perfect odor-busting oil blend. Anytime I need to deodorize a space (or my shoes or clothes) I use this blend… like the closets, stinky laundry, trash bins, toilets, you name it. I even use this blend for my DIY Carpet Freshener. Arrowroot powder (or cornstarch) helps to neuralize odors and absorbs moisture… perfect for those sweaty shoes. Baking soda is a natural deodorizer and absorbs odors. Essential oils provide a natural scent and can help to deodorize as well. The blend Purification (made with citronella, rosemary, lemongrass, tea tree, lavandin, and myrtle essential oils) is really very effective in purifying and removing odors for carpets, laundry, etc. Did you make this DIY Shoe Powder? Don’t forget to rate them and comment below to let me know how it went. You can also FOLLOW ME on Facebook, Instagram and Pinterest to see what other fun things I’m getting up to. Got stinky shoes? 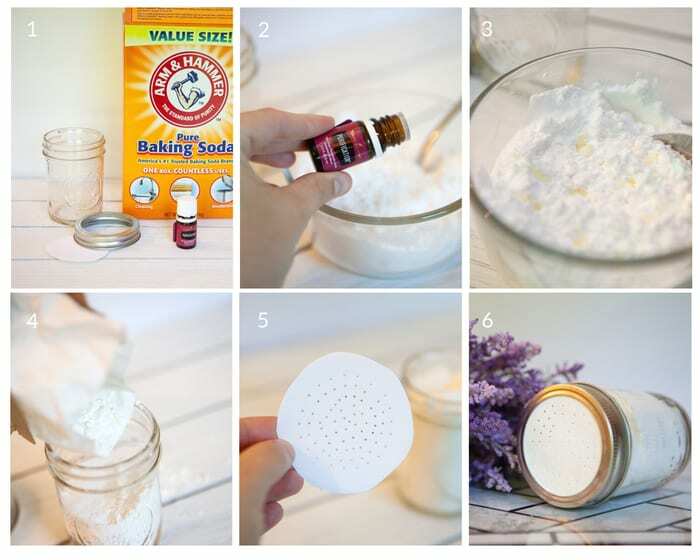 Deodorize them and make them smell fresh and clean with this DIY Shoe Powder. It's so easy to make and made with all-natural ingredients. It's like the natural remedy for stinky shoes. Combine arrowroot powder and baking soda into a glass jar with metal ring lid. Add essential oil (this helps with odor control) to the mixture in the glass jar. Use a spoon to mix well. Cut cardstock to fit the lid. Using a nail or thumb tack poke holes into cardstock. Place it on top of your glass jar then secure with a lid ring. Sprinkle in shoes at night. Empty them out into the trashcan the next morning.